Buy 1 for $14.16Buy 2 / Save $0.76!Buy 3 / Save $2.83! Fennel is high in calcium, iron, potassium, vitamin A and vitamin C. It also contains some protein and phosphorus. The seeds can be used to stimulate milk flow, as an aromatic stimulant for digestive disorders, and as a carminative, and can be used to help support infant colic. 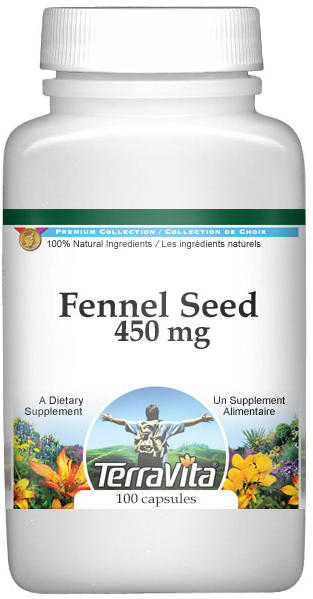 Fennel is also an expectorant, diuretic, and antispasmodic. In China, a poultice of the powdered seeds is used on hard-to-mend snake bites. The seeds are used in tea and in liquid extract form. The fruits may contain up to 28 percent by weight a fixed oil consisting mainly of petroselinic acid, oleic acid, and linoleic acid. The essential oil, composing up to 8 percent of the weight of the fruit, contains trans-anethole, fenchone, estragole, limonene, camphene, and other substances. The oil reportedly checks spasms of smooth muscles in animal experiments and is antibacterial. Fennel is an annual, biennial, or perennial native to Eurasia. It has become extensively naturalized in south and central California where it is often called wild anise. Fennel grows to six feet in height and has an erect, round, smooth, striated, jointed and branching stem. The leaves are long, linear and pointed, similar to dill leaves. The tiny yellow flowers grow on flat umbels with fifteen to forty rays. Each umbel is up to seven inches in diameter. The half-inch-long fruits are oval and greenish-gray with prominent ribs. Copper or bronze fennel (var. rubrum) has bronze leaves with a metallic lustre. F. vulgare var. azoricum (Mill) Thell., like celery, has edible stalks greatly thickened at their base. It is often erroneously confused with F. vuIgare var. dulce Batt. & Trab., whose leaves are not thick at the base and is primarily grown for the essential oil in its large fruits. Fennel is easily grown from seed sown directly in the garden after danger of frost has passed. Seed usually germinates in fourteen days. Thin seedlings to stand at six-to-twelve-inch spacings. Four to seven pounds of seed will plant an acre. Common fennel likes a light, dry, limey soil with a pH from 7 to 8.5 and full sun. Finocchio (var. azoricum) needs a rich soil with lots of moisture to produce succulent, edible stems. Once the stems become about an inch thick, they can be hilled with soil to blanch the stems and produce a milder flavor. Harvest ten days after hilling. Commercial fields have produced 600 to 1400 pounds of seed per acre. The roots are edible and may be harvested in the fall of the first year. Leaves and stems should be harvested for fresh use before the plant flowers. Seeds are harvested in late summer as they begin to turn their characteristic grayish-green color. The boiled, blanched stalks make a wonderful vegetable in and of themselves. The fihiform leaves are a great addition to soups and salads, and especially complement fish. Fresh leaves can be chopped into a vinegar and oil salad dressing in the blender. The seeds are used in breads and cookies, and a mild anise-like tea can be brewed from the leaves or seeds.